1/16 DIN sized Manual Setter has large PV display, and transmit 4 to 20 mA DC signal by manual operation. It can be used as a remote setter of target setpoint for digital Indicating controllers. Two alarm outputs and PV retransmission output are standard features. 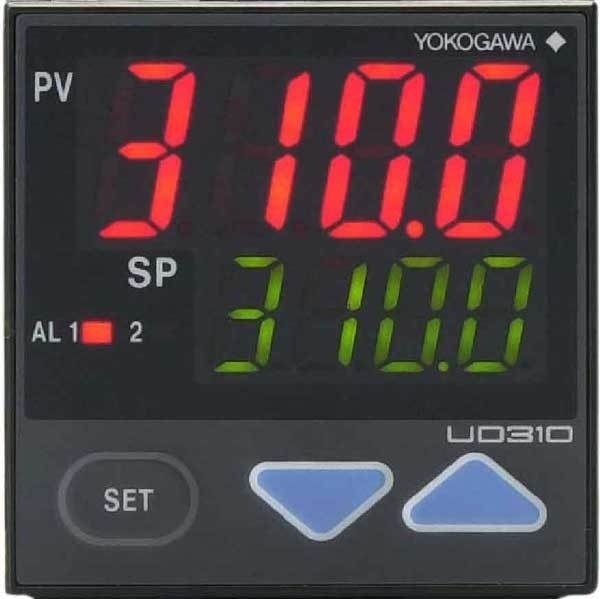 The UD310 Manual Setter (1/16 DIN size) has a PV display, and transmit 4 to 20 mA DC signal by manual operation. It can be used as a remote setter for digital Indicating controllers. The SP (target setpoint) will be output 3 seconds after the change. The two alarm outputs and a PV retransmission output are provided as standard functions. IP65 splash-proof and dust-proof designed front panel. Universal input for Thermocouple, RTD and DC mV/V signals. PV display disappeared function, when PV display is not necessary. Standard retransmission output of measured value (PV). Standard universal power supply (100 V to 240 V AC) and optional 24 V AC/DC power supply.